Determine the variable ordering needed to use forward sampling on a Bayesian network. Apply concepts from the rejection sampling algorithm to a simple problem. Apply concepts from the importance sampling algorithm to a simple problem. Apply concepts from particle filtering to a simple problem. Define the conditional probability table of node B by P(b|a) = 0.0015, P(b|¬a) = 0.56. In addition, assume P(b,c)=0.2. Note: we sometimes use a shorthand notation for boolean variables. 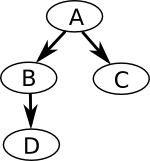 For example, P(b|¬a) is equivalent to P(B = true | A = false).